The natural beauty of copper is unique because its patina changes over time. 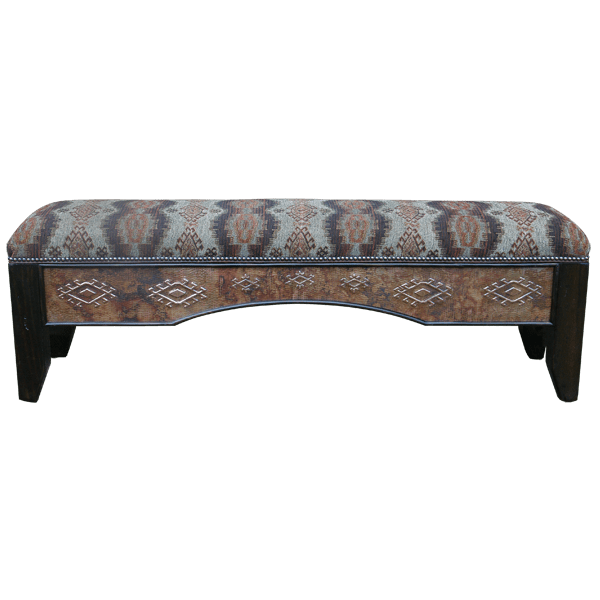 The hand hammered and hand tooled copper adorning this handcrafted, Western style bench will become more interesting with each passing year. The curved, Spanish colonial style apron adorning the front of the bench is covered with a hand hammered copper panel, and the panel is embellished with remarkable, hand tooled copper geometric designs. Running through the entire top of the apron is a black, leather cord. The well padded seat is designed without a back, and it is upholstered with beautiful, gray, patterned, fine fabric. The fabric is precision hand tacked to the wood frame with lovely, decorative nails. The bench is supported by sturdy, solid wood, straight legs, and it has an elegant, dark finish. It is made from the best, sustainable, solid wood available, and it is 100% customizable.